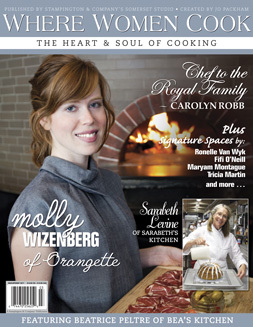 The second issue of Where Women Cook is now on newsstands across the country, and it features such amazing women as Molly Wizenberg, Sarabeth Levine, Chef Carolyn Robb, Tricia Martin, Ronelle Van Wyk, Cheryl Day, Maryam Montague, Orianne Cosentino, and Renee Shettler. To say that I’m honored and humbled to be included in the same magazine as these talented women is an understatement. You can learn more about all the women at the magazine’s blog, Amuse Bouche, where I will be next week with stories, photos, tips, and of course another recipe. Thanks again to Jo Packham and Ryne Hazen for visiting us last fall for the photo shoot and for being so fantastic to work with. And later this year, there will be more beautiful photos and food from women’s kitchens with the release of the book Where Women Cook Celebrations. More on that soon! Congratulations!! You belong in good company, Mz Meyers! congratulations, andrea! this is such fantastic news. so happy for you! I just picked this magazine up on the way home from work tonight. I am looking forward to snuggling up on the couch and reading it cover to cover. The last issue was great. Congratulations on being included. I’ll look for your article. Loralee, I just saw it. Thank you so much, it turned out beautiful!